After receiving an invitation from Intense Cycles to join them in Italy, Wil travelled to Punta Ala for a two-day launch to ride the brand new Carbine. It’s warm, sunny, and I’m applying another fresh coat of sunscreen in preparation for an afternoon out on the arid hills around Punta Ala. In a pleasing turn of events, it’s not the typical British mud-based splatters that I’m wiping away from my face, but sweaty Italian-dust that I’ve accumulated during the morning’s bike ride. The eight of us have just finished a carb-loaded two course lunch of fresh croccante salad, mozzarella cheese and pesto-coated spaghetti, and everyone’s looking a touch sleepy. 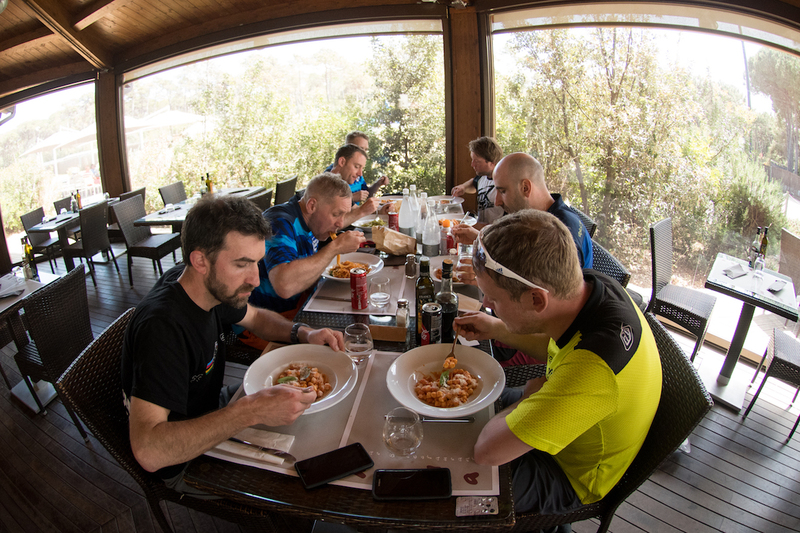 A post-lunch espresso is mandatory, but even with the caffeine boost, we still make the decision to take a wee interlude before gently easing into the rest of the day’s riding. The struggle is real. But we’re all working. Honest. 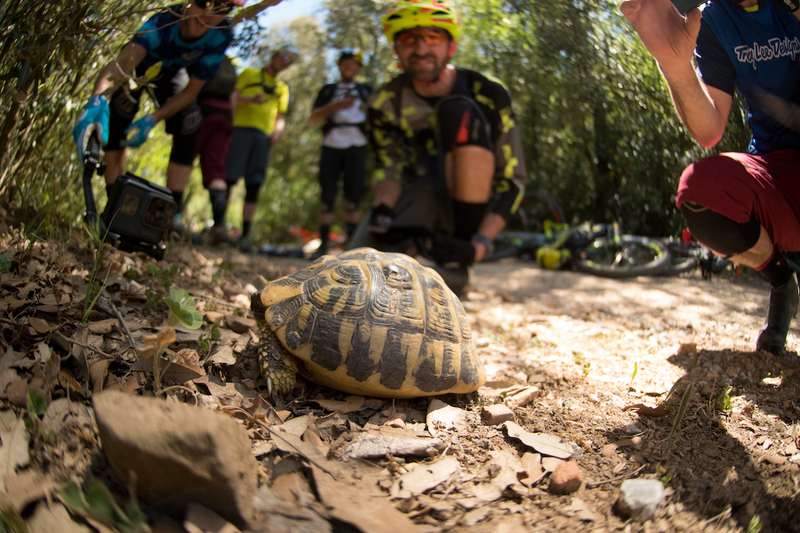 We’re in Italy for a two-day bike launch with Intense Cycles. It’s a small and entirely British affair, with just three of us journalist types including Mick from MBR, Tom from BikeRadar, and myself. Together we’re joined by Ross, Declan and Martin from UK Intense importer, Saddleback. After being flown into Pisa airport, we hitch a ride 100km south along Italy’s western coastline, putting us about halfway up the shin of the country’s geographical ‘boot’. This is new territory for me. 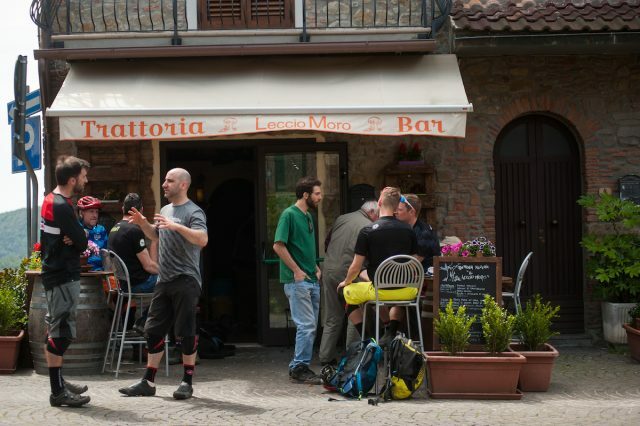 I’d not travelled to Italy before, and I was chomping at the bit to get stuck into some local riding and quality Italian food. Punta Ala is right on the coast mid-way down the West side of Italy’s geographical ‘boot’. 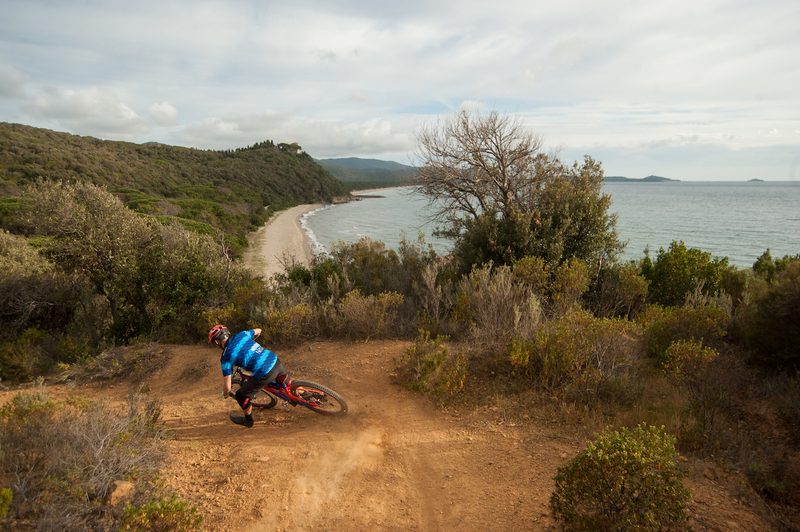 Our home for two nights would be the Puntala beachside camp resort, where we were positioned perfectly to explore the trail network around Punta Ala. Punta Ala – heard of that name before? For those of you who have, you’ll know that we’re in exactly the same location that the very first round of the very first Enduro World Series was held back in 2013. 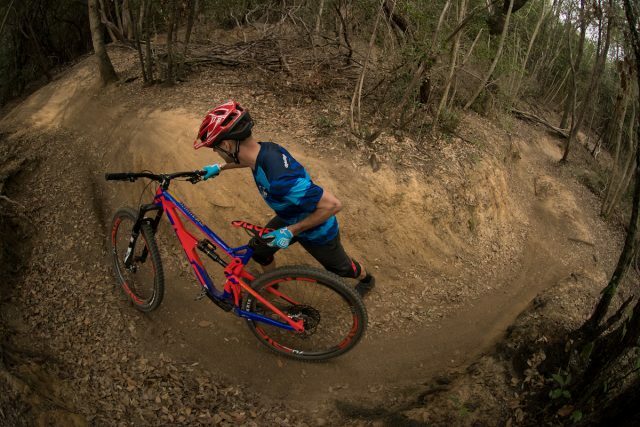 And with loads of rocky, technical and rutted-out singletrack at our disposal, it would prove to be the perfect environment for riding the pants off Intense’s latest enduro bike; the Carbine. 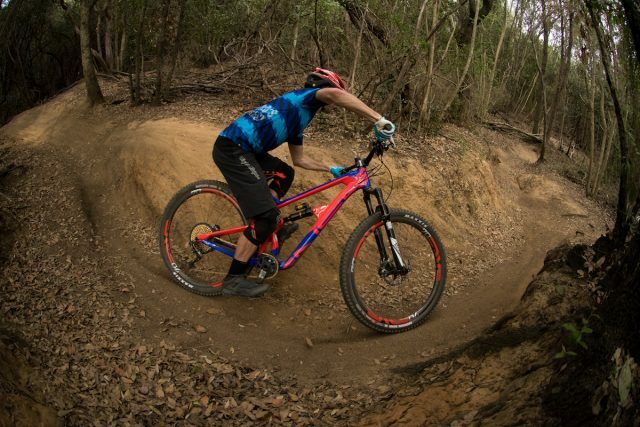 The Carbine is a name that many mountain bikers will be familiar with, having been the very first carbon fibre mountain bike to have come from Intense back in 2011. That first bike launched as a 26in-wheeled machine equipped with 140/152mm of travel, a VPP suspension design, and geometry that saw it occupy the technical trail bike space in the Intense lineup just below the bigger travel Tracer. That first Carbine rapidly became the most popular model from Intense. And I mean really popular. The traditionally alloy-only US manufacturer sold Carbine’s hand-over-fist, and sales of the Carbine very quickly eclipsed its alloy brethren. 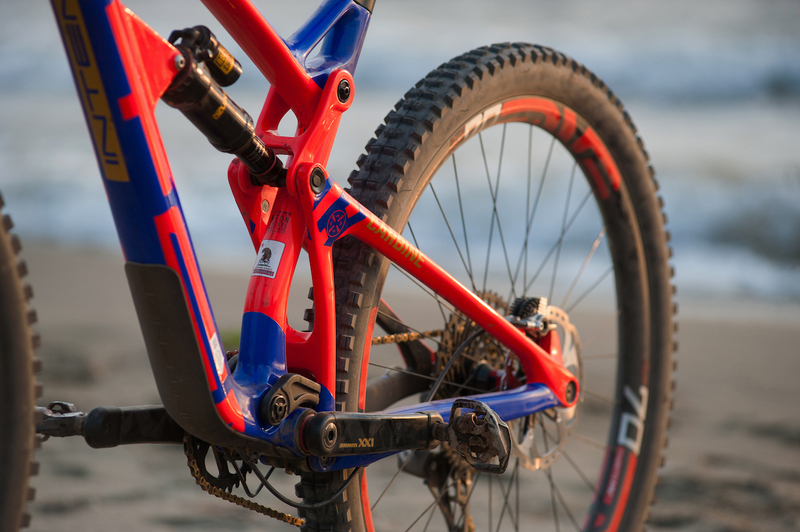 Much as it did for the likes of Santa Cruz and Yeti, demand for Intense’ carbon product grew fiercely as interest for its alloy product dropped off. And perhaps catching Intense on the back-foot somewhat, the immediate popularity of the Carbine would later be looked back on as a key turning point for the brand. Mick getting the pre-ride journo faff on. 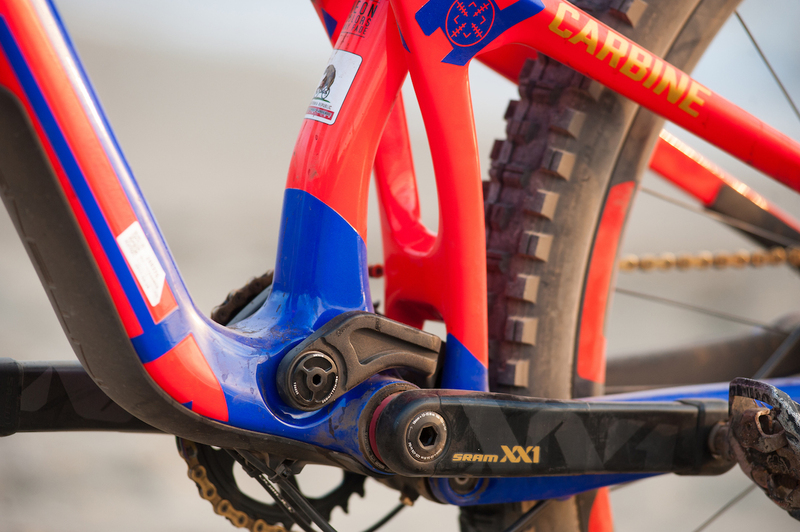 Within about 18 months of launching the original Carbine, the successful recipe was adapted to suit 27.5in wheels, and then in 2013, a new frame was developed for 29in wheels too. 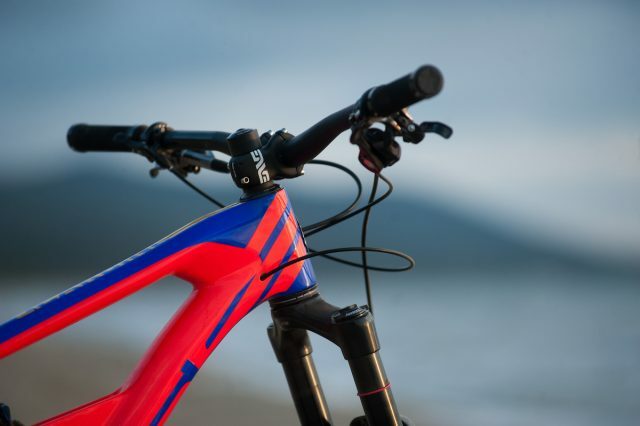 Although the 26in and 27.5in versions sold well, it was the Carbine 29er that won out the popularity contest, and has remained as a key model in the Intense lineup since. Fast-forward to 2017 though, and it isn’t just the Carbine’s wheel size that has evolved. 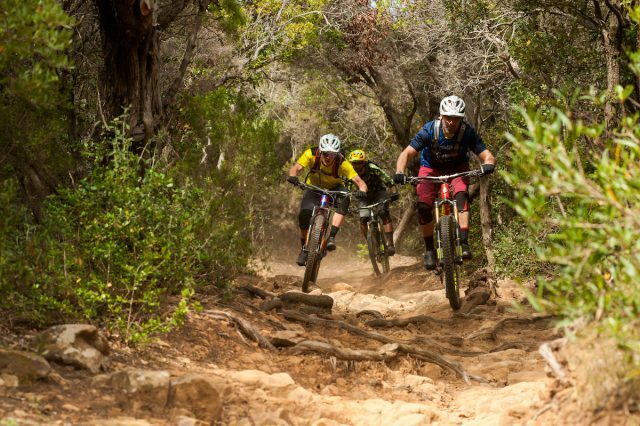 Intense has had a shakeup of ownership and management, and the brand will no longer produce any new alloy mountain bikes moving forward. Following the will of the market, every model in the lineup will now be exclusively manufactured from carbon fibre. For a brand steeped in history of handmade alloy frames with a ‘Made In The USA’ mantra, the new chapter is well and truly underway. 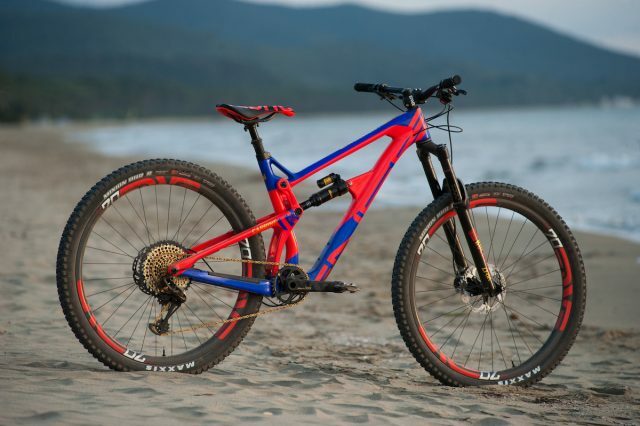 Part of that new chapter for Intense is a reworking of its full-suspension lineup, with an evolved suspension platform, modernised geometry and new frame standards being implemented across the board. 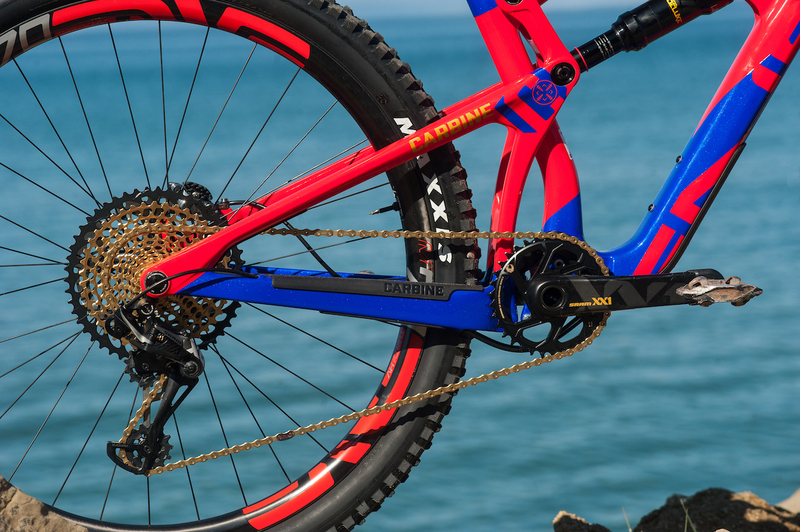 The latest bike to receive the overhaul treatment is the Carbine 29er. Or as we shall now simply refer to it; the Carbine. With 10mm more rear travel than the old Carbine, the new frame features 155mm of rear wheel travel and is paired up to a 160mm travel fork. It uses the new JS Enduro suspension linkage, long-and-slack geometry, and a component package that’s designed to handle the severity of your average Enduro World Series stage. It is an absolute beast of a bike. The new Carbine gets juiced up with 155mm of rear travel. 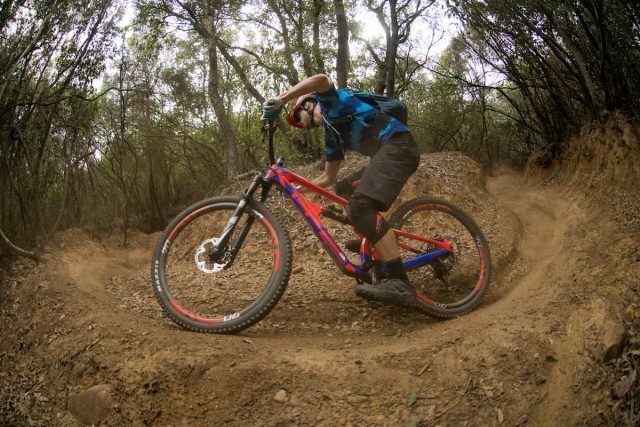 In terms of market placement, the new Carbine is very much part of the new wave of progressive 29er trail/enduro bikes. 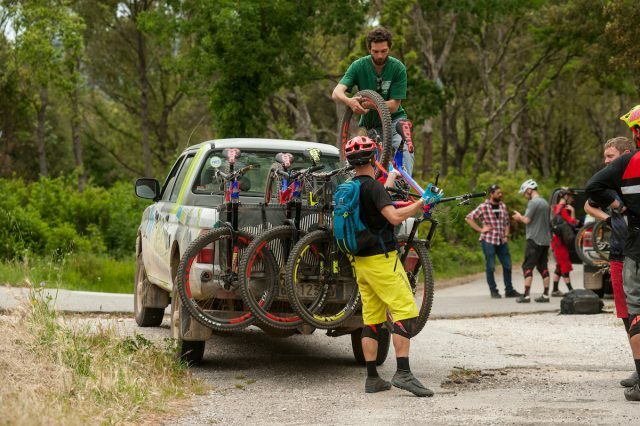 Alongside the likes of the Specialized Enduro 29, the Trek Slash and the Yeti SB5.5, the new Carbine makes use of tougher tyres, wider rims, and stiffer Boost’d wheelsets to make for a more capable big-wheeler that’s eliminated many of the compromises that plagued earlier 29in full suspension bikes. 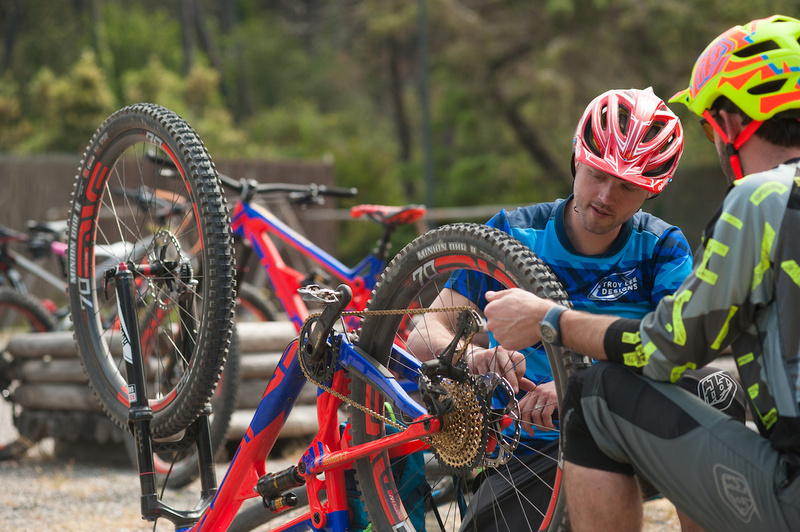 Highlighting all of these recent improvements, we recently coordinated a modern geometry 29er group test for the current issue of Singletrack Magazine, where we discussed the advantages that the big wheels provide. 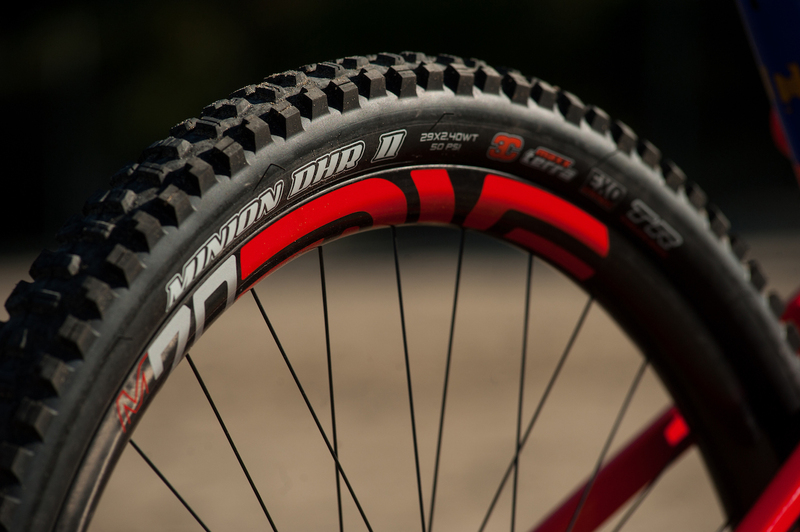 Those advantages being increased traction, stability and straight line speed on very rough and demanding trails. Advantages that are currently being used to devastating effect by some of the world’s fastest EWS and World Cup downhill racers. 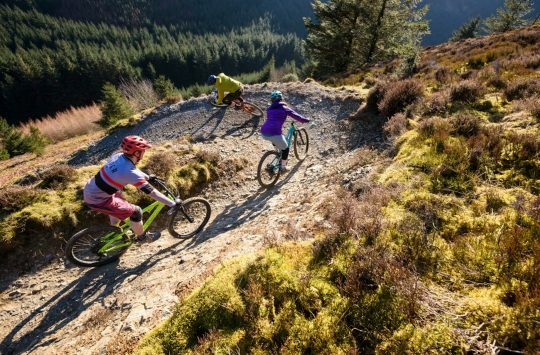 Of course Intense already produces 29in mountain bikes, including the excellent Primer trail bike that Barney reviewed last year – a bike that has proved to be a hit with the wider Singletrack test team. 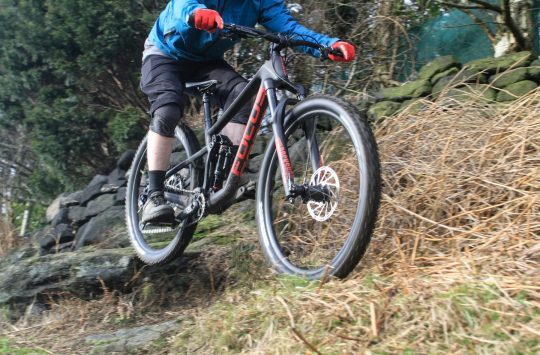 And having had experience with some of Intense’ other new bikes, including the lightweight Spider 275, the ACV plus bike, the trail-scorching Recluse and the Tracer enduro sled, expectations were high for the new Carbine. 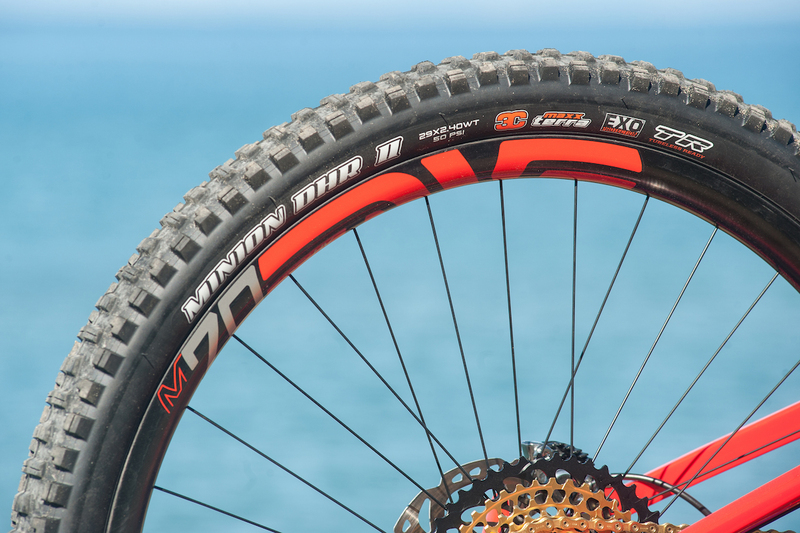 The new Carbine is all-carbon, and all-enduro. Although the Carbine shares the 29in wheelsize of the Primer, it’s best not to think of the Carbine as a longer-legged Primer, but rather a 29in version of the Tracer. 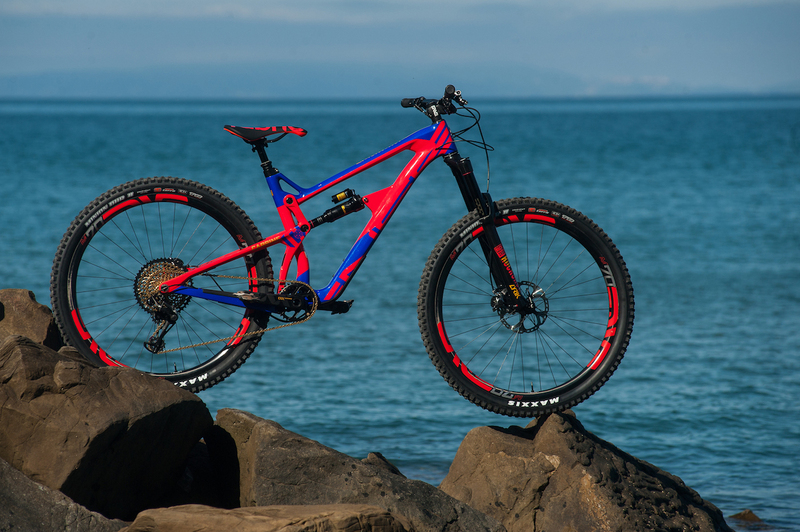 This bike is billed by Intense as a ground-hugging speed demon, and given that Intense Factory Racing’s Jack Moir has been piloting a prototype Carbine for the 2017 Enduro World Series, that should give an indication of its intentions. 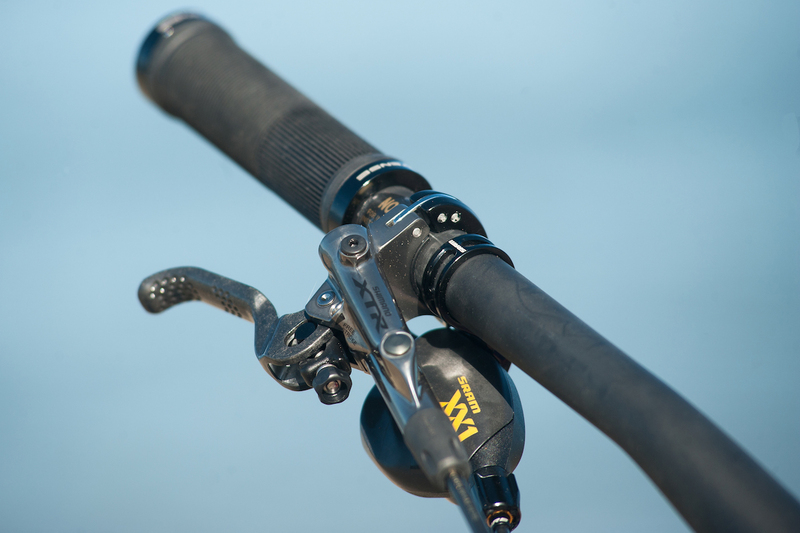 The heart of the new Carbine is the JS Tuned suspension linkage. An evolution of the previous VPP suspension platform, the JS Tuned suspension design no longer adheres to the exhausted VPP patent, and so the orientation, pitch and length of the two counter-rotating linkages has been altered to be completely unique to Intense. Intense Cycles are using three different suspension platforms for the new range of full suspension bikes. The Carbine uses the JS Enduro Linkage. There are currently three different iterations of the JS Tuned suspension platform. 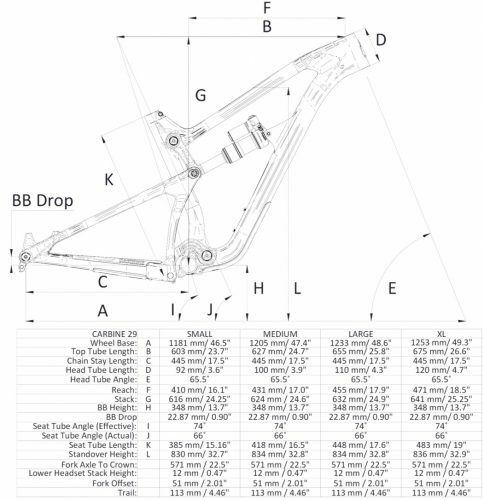 There’s the JS Trail linkage that’s used on the shorter-travel Spider, Recluse and Primer models, and the JS Downhill linkage that’s found on the M16. Sitting in between is the JS Enduro linkage, which is featured on both the latest Tracer, and the new Carbine. The long angular lower linkage mounts forward of the BB. Compared to Intense’s shorter travel bikes, the linkage setup on the Carbine looks quite different, with a longer upper link and a much longer and heavily angled lower link that mounts forward of the bottom bracket. The difference in performance between the two designs can be visualised in the leverage curves, with the JS Enduro link on the Carbine and Tracer delivering a significantly more progressive spring curve through both the mid-stroke and end-stroke of the travel. Compared to the old Carbine, the new Carbine’s suspension is designed to offer better small-bump compliance, more mid-stroke support, and better bottom-out resistance. All good things for sure. The new Carbine has a flatter spring curve, with more end-stroke progression for big-hit performance. 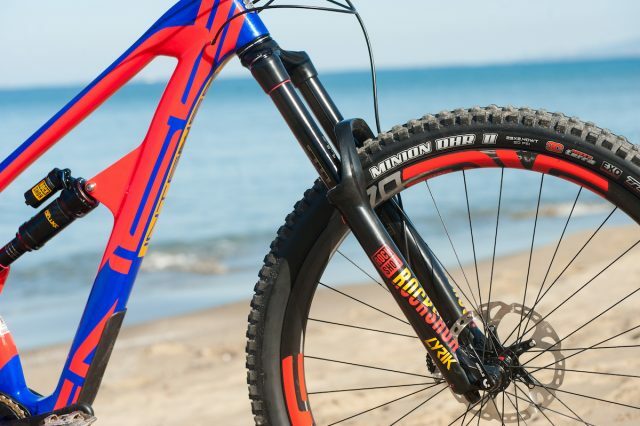 To handle the bike’s 155mm of rear wheel travel, there’s a huge 230×60mm metric shock out back, with the Factory spec’d model getting a RockShox Super Deluxe RC3. However, unlike some other new full suspension trail bikes, there are no trunnion or bearing eyelets to be found on the Super Deluxe rear shock, but rather standard ol’ DU bushes used at both ends of the rear shock. And unlike previous Intense models, there is no ability to change rear travel – the Carbine is designed solely for 155mm. 160mm travel RockShox Lyrik fork. 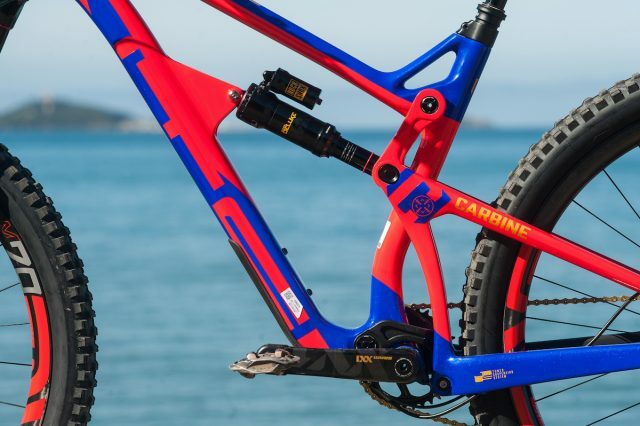 Like the rest of the Intense line, the Carbine uses a full carbon frame with two different grades of carbon fibre on offer, along with five different build kit options. The Foundation and Expert complete bike options use the standard carbon frame, whereas the Pro, Elite, and Factory bikes will come with a lighter SL carbon frame. Whilst sharing the same geometry, shape and tube profiles, the SL frame is built with a more densely-woven high modulus carbon fibre and a carbon upper link that helps to drop approximately 260g of weight. The SL frame is also available on its own for £3100 for those riders who want to build up their own. 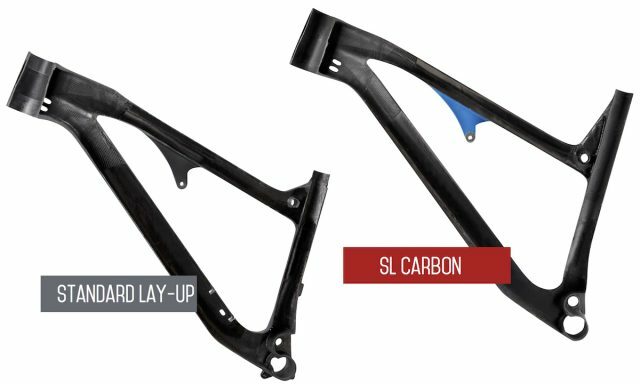 The SL Carbon frame is 260g lighter by using a carbon upper linkage and a higher grade Toray T1000 carbon fibre. 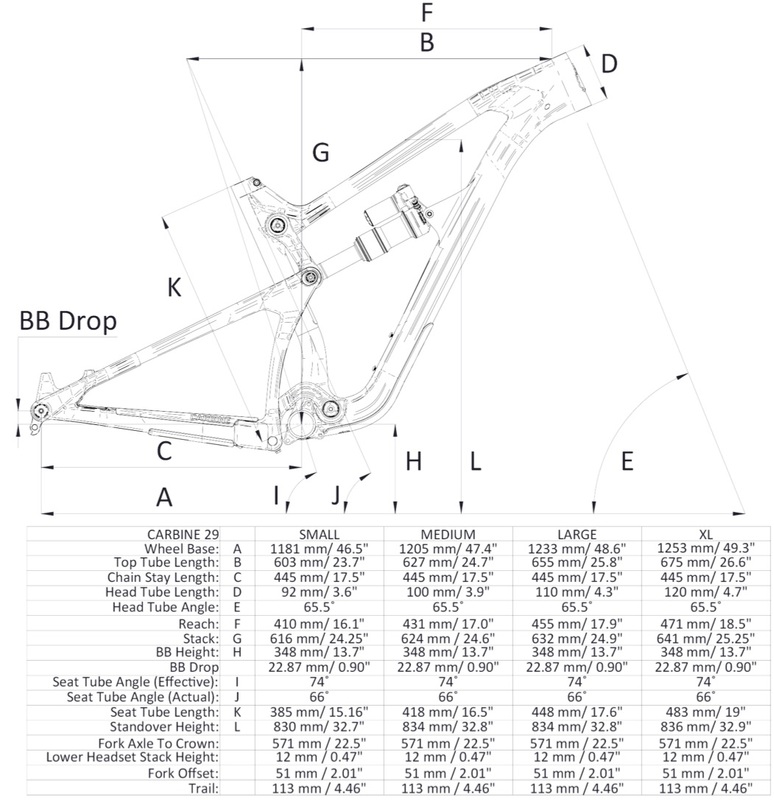 The feature list of the Carbine is as you’d expect for a boutique carbon frame. There’s a chunky tapered head tube and a wide PF92 bottom bracket – both of which are made as separate one-piece carbon fibre tubes that are then moulded into the frame during the final curing process to ensure precise alignment of the bearing cups. You’ll also find ISCG05 chainguide tabs and Boost 148x12mm hub spacing on the Carbine frame. 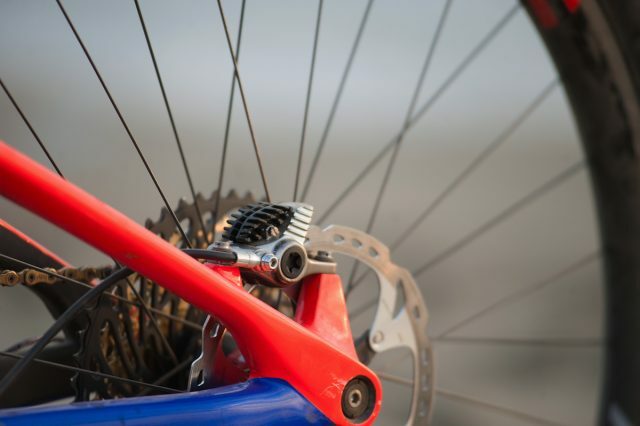 Locking down the rear dropouts is Intense’ own tapered alloy axle, which uses a captured cone nut that eliminates any chance of the axle loosening during use. Covering the underside of the downtube and the inside of the drive-side swingarm is integrated rubber armouring, which is substantially thicker than the crummy protectors that peeled off on our previous Recluse test bike. *Note: New, thicker rubber downtube protectors are now being used on the latest Recluse frames, and are available for existing Recluse owners. Internal cable guides take the “F*#KING PIECE OF S@!T” out of routing cables. To reduce noise and paint rub, the frame runs internal cable routing. Making installation a helluva lot easier, Intense has moulded in foam-wrapped plastic guide tubes. On behalf of mechanics everywhere, we say thank you Intense! Cable routing is biased to the US and Euro markets. So not as neat with UK moto-style brake routing. But while the internal cable routing guides are good, unfortunately the headtube ports are biased for US and European riders who route the rear brake for the right hand. On our test bikes that are setup moto-style with the rear brake on the left side of the bars, there’s a rather unsightly sharp bend to the brake hose where it enters the left side of the head tube. Masses of standover clearance from the seat tube brace and dropped top tube. Another conscious decision by Intense’ designers was to build the Carbine with shorter seat tube lengths to allow for 150-170mm travel dropper posts. A by-product of this design is the increased standover, and thanks to an additional seat tower used on the Large and X-Large frames, the standover height increases by only 6mm between the Small and XL frame sizes. Topped off with a tidy integrated seat clamp, the seat tube itself is kinked forward to allow for more clearance around the rear tyre and swingarm, while the 1x-specific design affords more flexibility around the beefy chainstays. With a 65.5° head angle, the Carbine is nicely slack. It’s also quite long, with Intense increasing reach measurements across the size range over the previous model. The effective seat angle sits at a reasonably steep 74° to keep rider weight over the bottom bracket, and the head tube is kept compact to ensure cockpit heights don’t end up in chopper-territory with the 160mm travel fork and 29in wheels. The Factory spec features ENVE everywhere, with a SRAM 1×12 drivetrain. The bike we were to ride in Punta Ala was the all-guns-blazing Factory spec model. 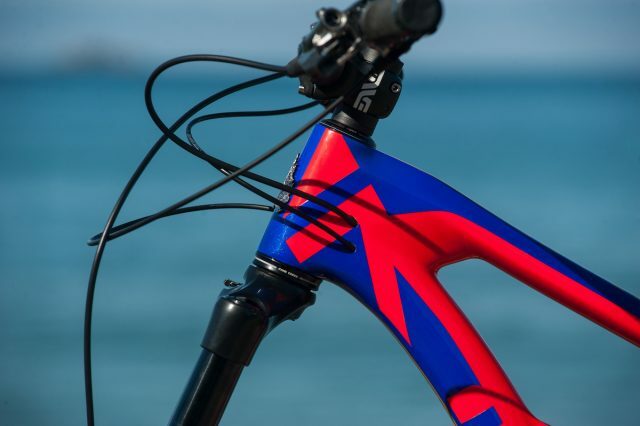 Sitting at the top of the 5-model tree, the Factory spec draws heavily from the components used by the EWS race team. There’s a full SRAM XX1 Eagle 1×12 drivetrain, ENVE wheels and cockpit, RockShox suspension, Shimano XTR Trail brakes and a Fox Transfer dropper post. With the absolute crème of the crop parts spec (including a custom carbon fibre Fabric saddle), this bike couldn’t be more high end if it was hoisted up by a 100-story tall tower crane. 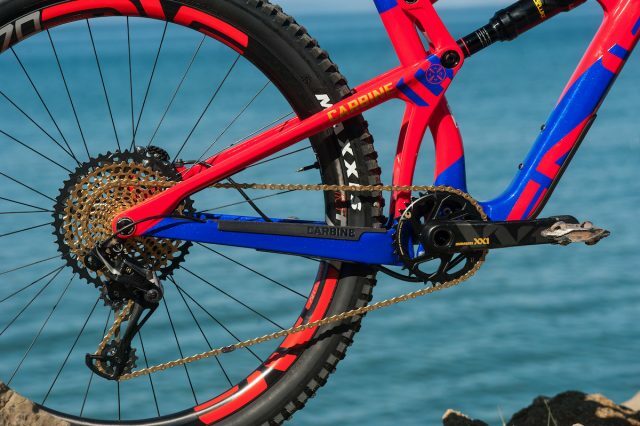 Although the £9k sticker price is as eye-popping as the paint job, the good news is that you can enter Carbine-land for just £3900 for the Foundation spec model, which still comes with a capable RockShox suspension package, 1×11 SRAM drivetrain and Shimano SLX disc brakes. The first day of riding started with some mellow pedal-friendly trail riding. The plan for our two-day riding trip in Punta Ala would be to spend the first day trail riding and scouting out photos, while the second day we’d receive some shuttling assistance to access some higher, and more technical descending trails. The guide for our Italian job would be James McKnight; an ex-Dirt crew member and partner of World Cup downhill shredder, Morgan Charre. 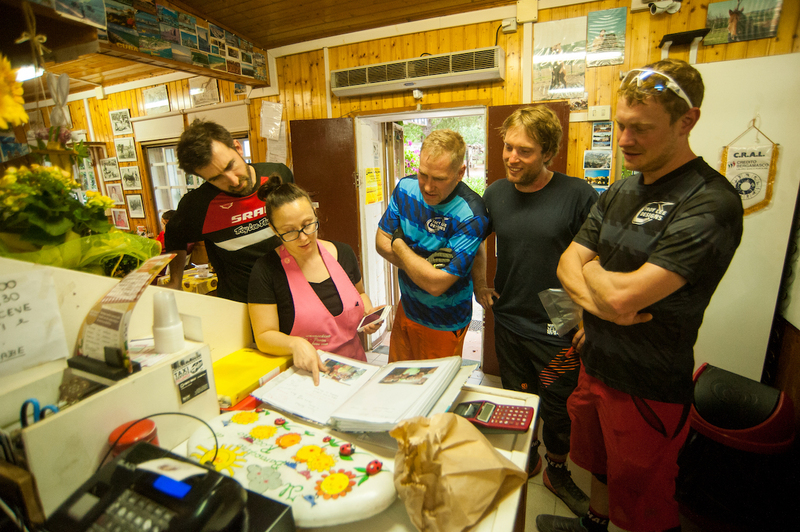 James is based in the French Alps these days, but he’s been running marketing for the Punta Ala trail network for the past two years, having welcomed numerous journalists to the area to help promote both the riding and the resort. James McKnight (our guide) is the chap 2nd from the right. He’s a dead-set legend, and one of the smoothest riders I’ve seen. 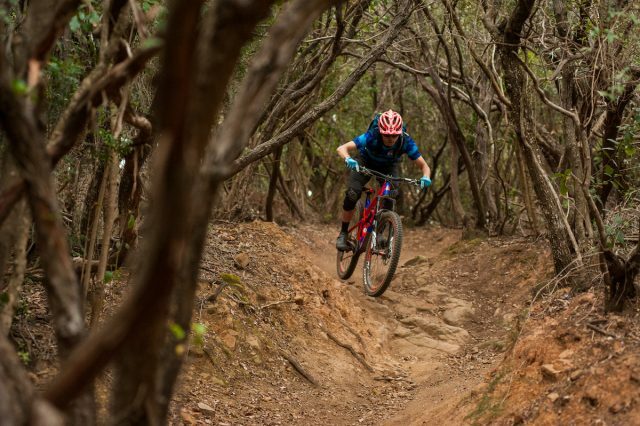 Aside from being one of the smoothest and calmest riders I’ve ever seen on a mountain bike, our softly-spoken trail guide turned out to be pretty darn good at putting together a ride itinerary too. Much like a skilled DJ, James’ two-day plan took us on the perfect journey, with idyllic riding progression that saw us start out on a network of more mellow (but still ripping) flow trails, before building up to more technical terrain, until reaching a crescendo on EWS-level singletrack by the end of the trip. 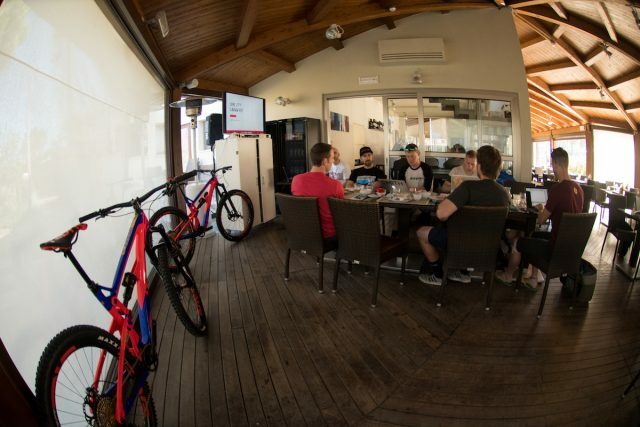 And without the typical time and riding restraints of your usual press launch involving 30-40 journalists, we were afforded significantly more time to ride, tweak setups, and peg technical questions to our hosts. Caught this guy snooping around trying to get snaps of our secret embargoed bikes. The high-speed gravy train blasting down the rooty trails of Punta Ala.
We’re joined on the riding trip by a young photographer called Ben Winder. Having officially studied photography at university, Ben has been steadily growing his client list in the mountain bike world, shooting numerous EWS rounds, enduro and downhill races across Europe, while also shooting for press launches like the one we’re currently on. Wearing a camera bag that’s far bigger than his slight frame, Ben joins us on the ride with an e-MTB that’ll allow him to speed off further down the trail to setup for happy snaps. I rode a Large size Carbine during the launch. Even with the Fox Transfer post slammed, the seat height was still a touch too high for me. For the launch, I’m provided a Large sized Carbine frame. Standing at 175cm tall, I’m typically bang-on for a Medium size. But as is the trend these days, everyone wants to go as long as they possibly can go, and with the shorter seat tube of the new Carbine frame, the theory is sound. Unfortunately, even with the outer collar of the 150mm travel dropper post slammed into the frame as far as it’ll go, the saddle is still a touch too long for my preferred 71cm BB-to-saddle height. The Carbine needs about 30% sag to get the rear suspension settled. The recommended suspension setup on the Carbine is for 30% sag on the rear, which sees about 150psi in the main air chamber to deal with the weight of both me and my loaded riding pack. For the Lyrik fork up front, 62psi gets me to a similar sag point whilst standing up on the pedals. After dialling in rebound, I leave the low-speed compression dials wound open to get a feel for the suspension action first before adding in more damping control during the day’s riding. The ENVE carbon cockpit is perfect – 45mm stem and 780mm riser bars are comfy. We’ve got a bit of a pedal to the first piece of singletrack, and the initial feel I get from the Carbine is one that it is roomy and planted. The big 780mm wide bars help to square off the elbows while sitting over the front end of the bike, and the generous top-tube length ensures that there is nothing cramped about sitting atop of the bike. The Large Carbine has an enormous wheelbase length of 1233mm – a combination of the generous 445mm chainstay length, long top tube and slack 65.5 head angle – and, as such, it has a very calm feel about it when meandering along the flats. 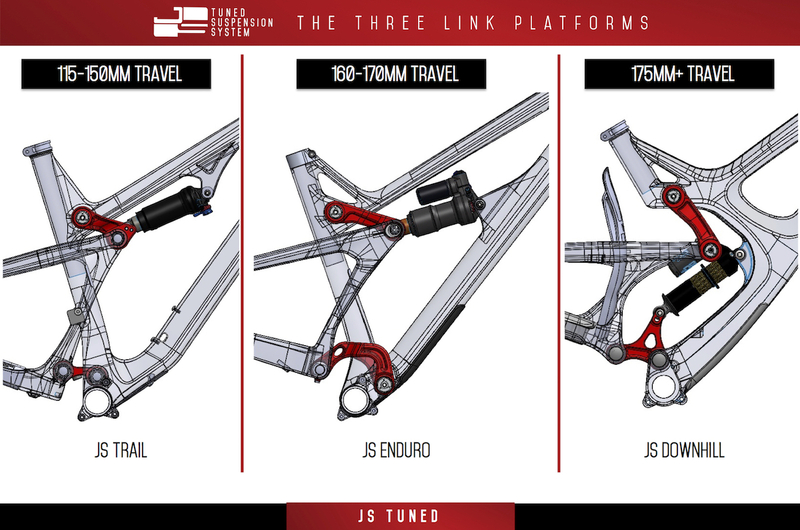 The JS Enduro linkage comprises of two short links that connect the rear swingarm to the mainframe. 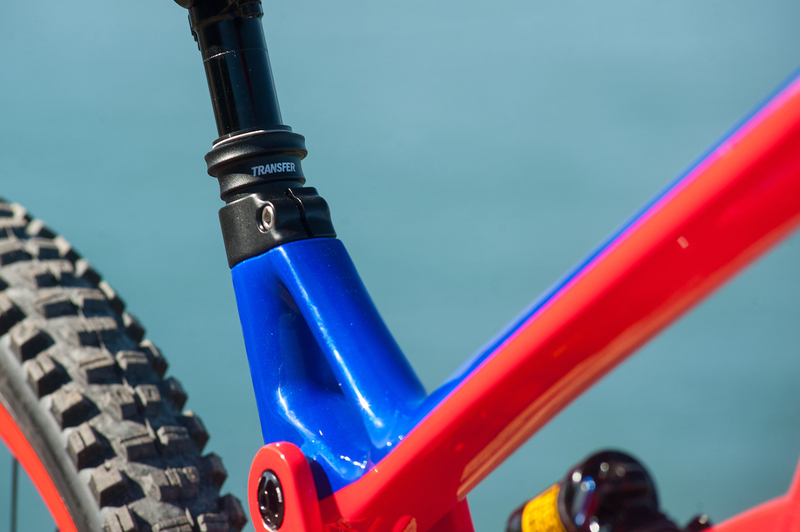 Despite the mini-DH feel, the steering is kept responsive via the 51mm fork offset and a short 45mm stem. 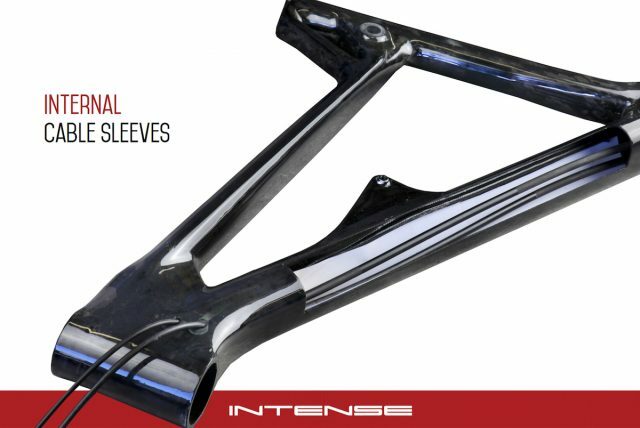 In a welcome trend we’re seeing more of lately, Intense has designed each frame size around the same stem length, so the steering dynamic is the same whether you’re on a Small or XL. And once we dive into the singletrack and start nipping through the trees, the Carbine surprises me with how nimble it feels. For such a big travel 29er, it feels more intuitive to pilot than I expected. Admittedly the stiff ENVE wheels and lightweight build kit are certainly helping in the mobility department, but the Carbine impresses with its sprightliness. Pedal response from the JS Enduro linkage is good, and while not as pert as the suspension on the Primer, the back-end doesn’t feel dumpy at all. The Carbine loves squaring off corners, with masses of traction on tap. Having tested the Maxxis Minion DHR II treads before, I can attest to their incredible cornering grip and braking traction – especially for riding on much steeper and rougher trails. They’re not the quickest tyre though, and the drag is noticeable on tarmac and firmer trail surfaces. However, they do have a noticeable escape velocity that suits the Carbine’s high-speed potential. Get the DHR II’s over their cruising threshold, and the big 29er starts to roll faster with considerably less rolling resistance. As the day progresses, it becomes clear that pootling is not this bike’s preferred speed. Point this beast downhill, and it just wants to go as fast as possible. 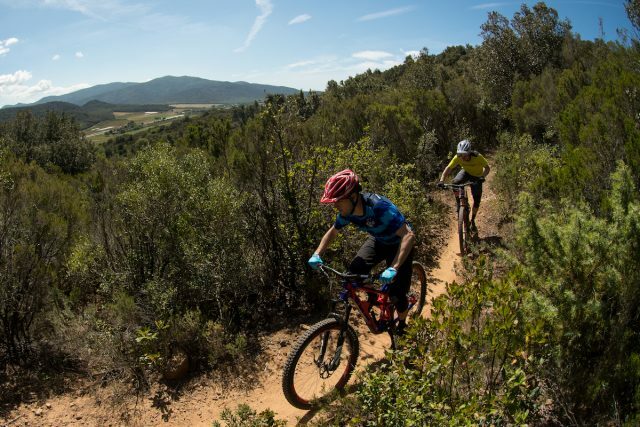 With dry and dusty conditions almost all-year round, the trails in Punta Ala are also littered with rocks, and so the undulating singletrack we’re snaking along provides opportunity to test the Carbine’s suspension both for technical climbs and descents. On the climbs, the bike shines with loads of pep and ground-hugging traction that allows us to clear craggy pinches with minimal tyre slip or pedal striking. In fact, I don’t hit the pedals at all in the kind of situations that would normally stall other trail bikes I’ve ridden lately. A combination of the supportive suspension and the Carbine’s tall 348mm bottom bracket height (unsagged) ensure the bike rides high, so spinning through chunder is no problem. Day 2 saw us don some mechanical assistance in the form of shuttle trucks. While we do plenty of speedy pedalling on the first day, the second day’s riding proves to be a better test of the Carbine’s flat-out descending capabilities, as we shuttle further up the mountains to enjoy longer and rougher trails. With loads of rocky outcrops and heavily-rutted gullies to bomb down, the speed and stability of the Carbine becomes much more apparent, with that long wheelbase and slack head angle keeping both tyres rolling with plenty of momentum. The rear shock swallows up large hits without concern, with a velvety feel that helps to isolate me from the rubble beneath. At high speeds on choppy terrain, the Carbine shines. For my 68kg weight, the Super Deluxe shock feels good. It’s smooth, and I’m using about 98% of the travel. I’m running the rebound just two clicks from full-fast to ensure it’s recovering fast enough for the chattery hits on our descent. 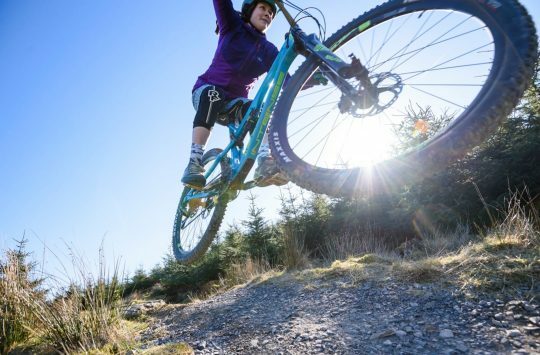 For launching over bomb-holes and squashing small lips on the trail, the rear shock is quick to retract and allow the tyre to stay glued to the terrain, providing excellent traction and connectivity. Although I’m pretty happy with the rear shock tune, Mick finds his shock blowing through its travel a bit more given he’s got a good 17kg of extra man-meat over me. We open up the air can to discover that the rear shock comes stock sans volume spacers, so Mick adds some to his shock to reduce the volume and increase progression. Once we get further down the descent and into the denser tree-line, the tight high-speed turns require a little more body english to get over the big Carbine over from left to right on the trail. Of course the same factors that make the Carbine so good at barreling in a straight line and crawling over rocks make it a little tougher to lean over for darting through sharp turns at pace. The weighty tyres and increased gyroscopic force of the wheels is certainly a contributor here, but in these situations, the Carbine feels a little too tall in the BB and a little too long in the back end to quickly carve those sharp turns that seem to come out of nowhere. The Carbine is a big bike though, and it needs wrestling through the tight stuff. It’ll still get round those sorts of high G-force turns, but your line will have to be more prescriptive, and you’ll be aware that the rear wheel is sitting further out behind you than on a comparable bike that uses shorter chainstays. Part of this also comes down to the bump-swallowing JS Enduro linkage, which offers excellent square-edge hit performance. However, it doesn’t quite have the same snap to it when exiting corners that you can get from other suspension designs. One thought on my mind while finishing off the descent and arriving to meet our shuttle drivers at the bottom of the hill is that I’d really like to try a Medium frame size. Aside from the saddle being a touch too high on the Large frame, the shorter 431mm reach on the Medium frame (compared with 451mm on the Large) is also appealing to me from a handling perspective. However, we only have Large frames available, so I’ll have to wait a while before I can get a secondary opinion on sizing. The Shimano XTR brakes and the SRAM XX1 shifting was perfect from whoa-to-go. 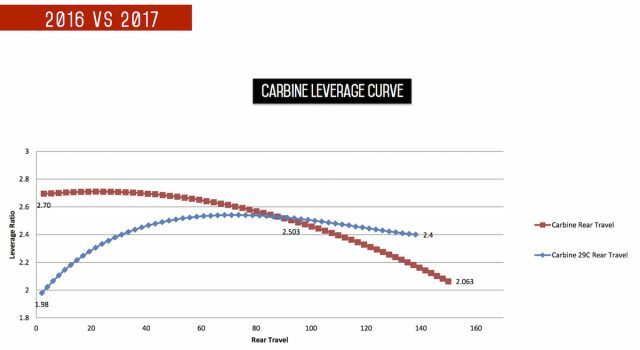 Throughout our two days of riding aboard the Carbine, there was very little that upset the bike overall. The SRAM Eagle drivetrain performed flawlessly, and the Fox Transfer dropper post was a noticeable highlight due to its buttery-smooth action, audible top-out, and brilliant 1x specific remote. The ENVE M70 HV wheels are strong and stiff, but somewhat unforgiving unless you’re a big/aggressive rider. The ENVE M70 wheels assisted with the Carbine’s speed and climbing abilities, but the bulbous carbon rims are very stiff and don’t deliver much in the way of vertical compliance. For more aggressive and heavier riders, the point-n-shoot handling will appeal, but for a lightweight and intermediate rider like me, I found myself getting pin-balled more than I would have liked. In a somewhat familiar experience, I did get some brake pump from the XTR stoppers on a few of the longer and more rapid descents, where I could feel the lever bite point changing as heat got into the calipers. Given our bikes were box-fresh, this could have been a simple bleed issue, but I have had it happen before with Shimano’s latest disc brake models. Otherwise I got along with the Carbine rather well. 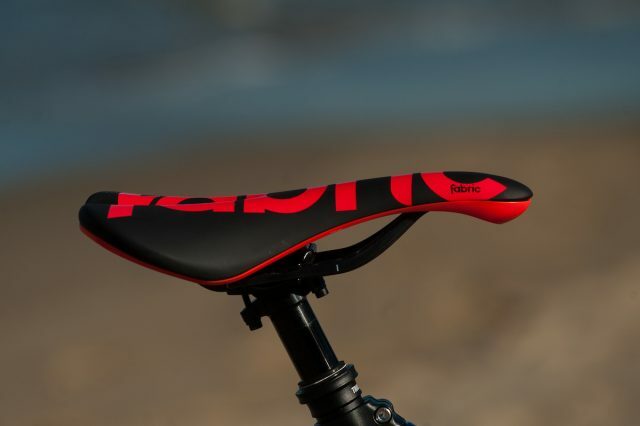 The Fabric Scoop saddle is a brilliantly comfortable perch for all-day pedalling, and I found the sweep and vibration damping of the custom ENVE carbon riser bars to be spot-on. Carbon railed saddle for gram counters. It also happens to be very comfy. Compared to the previous Carbine, the new version is a better and more capable bike in nearly every way. 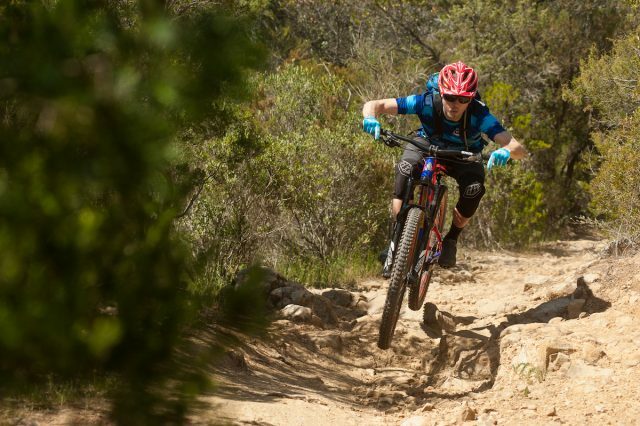 It’s a monster of a mountain bike, with gobs of plush suspension and raked-out geometry that makes it brutally fast on rough, chopped-out terrain. The stiff frame and responsive JS Enduro linkage ensures the rear wheel tracks the trail surface with impressive resolve, and you can confidently plonk the bike into some pretty hairy situations without fear of losing traction. 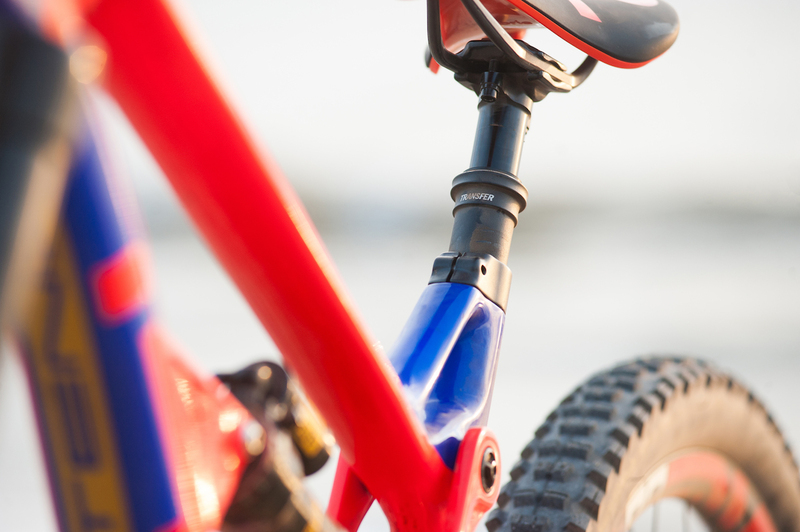 The back end isn’t quite as snappy through the tight stuff as comparable 29ers that are shorter and lower to the ground, but the Carbine’s stable suspension means it’ll pedal up and over some pretty ugly terrain, making it a great all-rounder. The Carbine is fast, stable, and highly predictable when the terrain gets rough. I’d be keen to try out a Medium size to see whether that’s a better fit for a rider of my height, and I’d also be keen to ride a Carbine fitted out with some alloy wheels, such as the DT Swiss M1700’s that come fitted on the £6300 Carbine Pro. 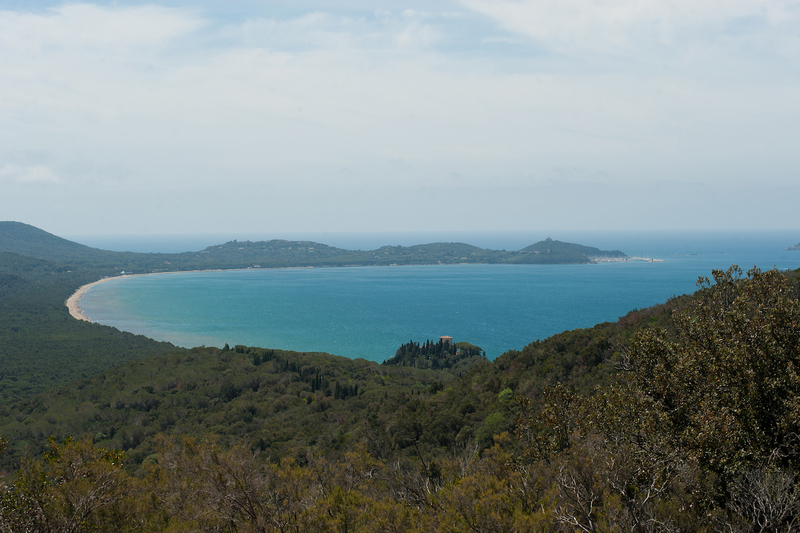 One other thing I’m keen on doing is getting back to Punta Ala for some more riding – this place is mega! 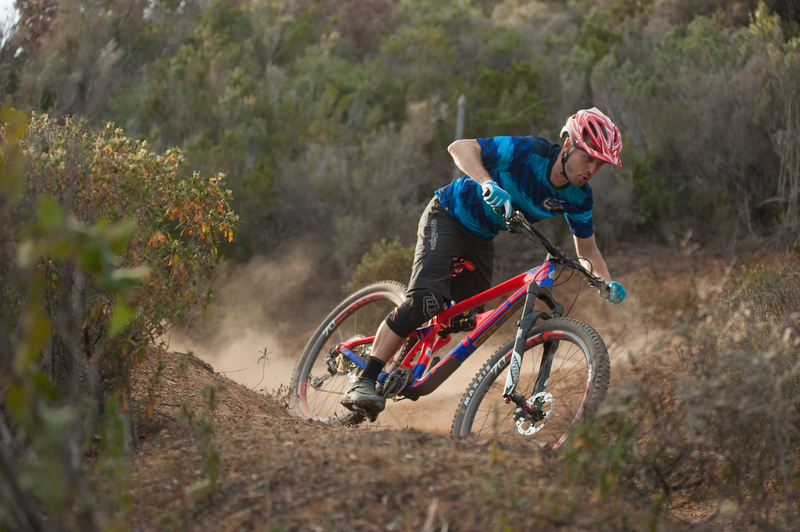 With 29in wheels and refined geometry, the Carbine is a race-ready enduro bike that’s built for flat-out speed. Flights, accommodation and hospitality for this press trip were provided by Saddleback UK. Is Wil going to get a warning for avoiding the swear filter as i keep getting on the Forum?? No, because we can swear but you can’t. Them’s the rules. 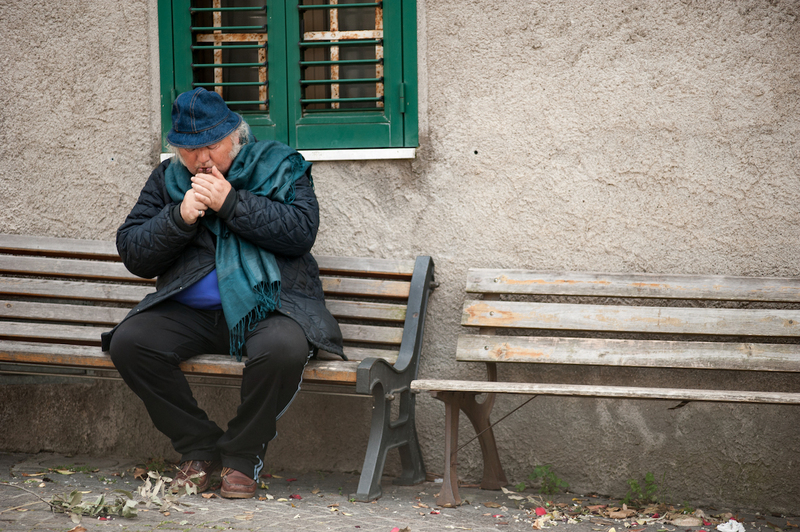 Forget You man, forget you!